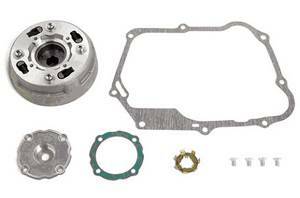 The OEM honda clutch is ok for the stock bore but at 115cc on up you need this kit to the get the most power output out of your "100"
(also able to install it along with OEM engine and OEM clutch cover). Raised the volume of the damper by changing the number of clutch dampers from 4 to 6. Changed the reduction speed ratio of oil pump from 2.187 to 1.833, to increase the discharge amount of oil per one engine rotation. Changed the primary reduction speed ratio from 4.437 to 3.833, raised the high gear status by 16%, and widened the choice of driven sprocket. Uses 10% more reinforced type clutch spring compared to APE100. Casted in iron to the clutch center and to the attaching surface of pressure plate friction disc to improve its durability. OEM lifter plate, guide pin and bearing flange bolt are to be reused. Since the primary speed reduction ratio will be changed, you will need to change your sprockets.